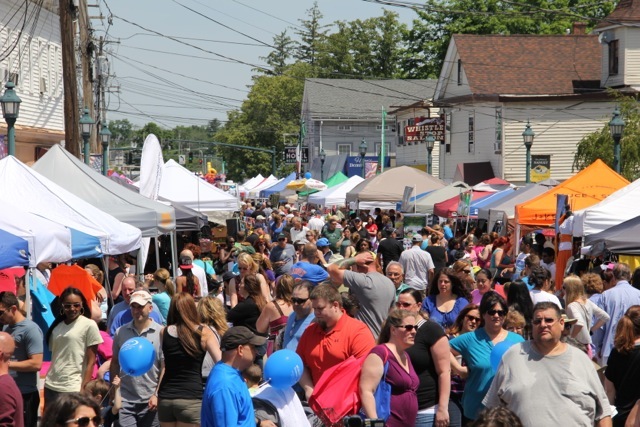 The Greater Nanuet Chamber of Commerce will host its Fifth Annual Nanuet Street Fair this Sunday, June 3 from 10 a.m. – 5 p.m. on Main Street. This year the fair has been expanded down to Orchard Street allowing for up to 220 vendors. Also new this year, the day will start with a free ‘mock brunch’ in front of the stage with pastries and mimosas with an acoustical guitar accompaniment at 10 a.m. Everyone who arrives by 11:15 a.m. will receive a ticket for the special “Small Town, Big Heart” raffle. There will also be a car show this year on Prospect Street. People interested in showing their car can sign up in advance or that morning. Prizes will be awarded for the car show. There will be a rides section for kids, more local entertainment, and several wine and beer areas. Musical entertainment and performances will take place all day in the Clarkstown Band Shell at Orchard Street and include local bands and several dance performances. Music and announcements will be pumped from the main stage throughout the fair to ensure everyone can hear what is going on throughout the day. “Each year we strive to do something different. We only host one Street Fair a year so we want to make sure it’s memorable. This year we thought we would treat parents to a mini brunch complete with a complimentary mimosa and have a car show for automobile enthusiasts,”Risa Hoag, president of the Greater Nanuet Chamber of Commerce, said. The Nanuet Street Fair features vendors from around the tri-state area that sell clothing and jewelry, artwork, handmade crafts, as well as local businesses that provide goods and services. Due to the number of people expected, attendees are asked to leave their dogs at home for everyone’s safety. All information about the fair can be found at www.nanuetchamber.com and questions can be directed to info@nanuetchamber.com.